Didier Schvartz was surprised when his eight-year-old grandson, Charlie, picked up the blue arm, examined it closely, then attached it to his own left arm, which extends just below his elbow. “He was fascinated,” says Schvartz. Charlie was born with a limb difference and has been fitted with various prosthetics throughout his life. But he has never worn them for long because he found them too heavy—or too pink. When Schvartz read about 3D-printed prosthetics, he knew the technology could help Charlie. Without a printer of his own, he approached South Shore Public Libraries (SSPL) in Bridgewater, NS. “Shape Space” at SSPL opened in 2013. It’s a public maker space offering 3D printing and scanning as well as software for 3D design. SSPL was one of the first public libraries in Nova Scotia to offer these services. Schvartz, who lives in Mahone Bay, downloaded free, open-source plans from the website Thingiverse. With the help of SSPL Community Engagement Coordinator Christina Pottie, he began printing 24 separate pieces of the arm, essentially melting spools of plastic and reforming them into specific shapes. The resulting arm and hand weighs just 250 grams and has an opposable thumb that meets all four fingers. Charlie was also born with autism and while some tasks are challenging, he is adept at building elaborate Lego structures. 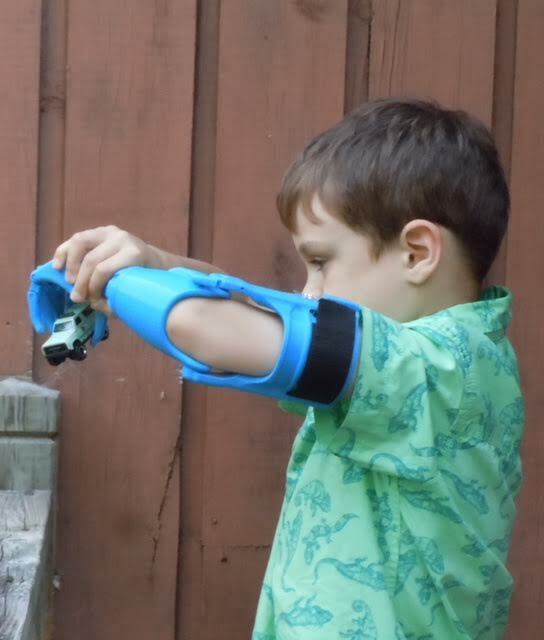 A very light prosthetic arm with a pincer grip—and in Lego-blue—helps Charlie do something he loves as well as try new things, like riding a bike. The first 3D-printed prosthetic limb was created in 2008, so the idea is not brand new. Organizations such as Médecins Sans Frontières have current programs to build and distribute 3D-printed prostheses to war-wounded civilians and others who lack access. Schvartz would like to further improve the design of the arm as well as tackle 3D scanning of limbs to customize fitting. He would also like to share what he has learned. “I believe it is best to put technology into the hands of people who need it,” he says, “especially now that this technology is cheap and portable.” He is hoping to help others in Nova Scotia create 3D-printed prosthetics for family, friends or themselves.